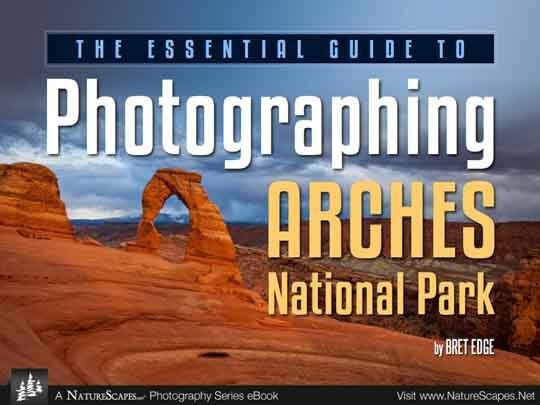 The Essential Guide To Photographing Arches National Park by Bret Edge. Copyright 2014 Bret Edge. Bret Edge is what I would call a power landscape photographer. His compositions are direct, with strong lines and bold arrangements that may often portray iconic scenery, but with more ingenuity and interest than most. The graphic design and lettering of Edge’s new guide to photographing Arches National Park are big and bold and frame his power images and direct text perfectly. In addition, NatureScapes’ logo and motif indicate that this new, bright and crisp PDF is one of their Photography Series eBooks and can be ordered directly from NatureScapes’ order page. Within the three main headings, each location gets a treatment. Each geographical area is laid out on one page with a short description; a section called, “Getting There,” essentially the trail directions; a “Need to Know” note that gives safety cautions, background, history, tips on how to tread lightly, or get more enjoyment out of each photo spot; and most importantly for our purposes, “Photo Advice.” Here Edge’s enthusiasm for the landscape shows, as does his acumen for open-ended suggestions that allow for more diverse possibilities rather than guiding everyone to make images like Bret Edge. This format is not only clear and concise, but it saves time over wading through the many other guidebooks and pamphlets on Arches National Park. As might be expected in a guide devoted solely to one national park, Edge covers all of the locations found in the more broadly focused book, The Photographer’s Guide to Canyon Country: Where to Find Perfect Shots and How to Take Them by John Annerino, but Edge also adds quite a few more photo spots and goes into more depth on each. In Edge’s guide the type, though small, is in a clear, readable font. Division into the various headings and subsections as described above make Edge’s guide quicker to read and easier to find essential information inside than many guides arranged in standard text formats. Moon Handbooks are known for quality and depth, but the Moon Handbook for Arches and Canyonlands National Parks, covers no more trails and destinations than Bret Edge’s NatureScapes eBook packs into only 30 pages. Besides, the Moon Handbook, of course contains minimal information specific to photography. A guide by Wilderness Press called 50 Best Short Hikes in Utah’s National Parks by Ron Adkison offers a rich narrative on Arches National Park including archeology, flora, fauna, park ranger interpretive activities and more, but the limited photographs in black and white do not evoke as much of what can be experienced visually. Travelers and explorers may read many books on the history and background of Southeastern Utah, but for photographers, Bret Edge lays it out best in his short easy to follow format. Only Photographing the Southwest: A Guide to the Natural Landmarks of Southern Utah & Southwest Colorado by Laurent Martres covers more photographic ground than The Essential Guide to Photographing Arches. However, Edge does offer a few spots and details about spots that Martres misses in his comprehensive photographer’s guide. Also, Edge’s Photo Advice is more specialized to fit local conditions and customized for photographing sandstone formations, reflecting the experience of Edge as a desert inhabitant and photography workshop leader in the area. The only change I would make to the Essential Guide to Photographing Arches is to add information on photographing the national park in the winter or during the middle of the day when the season or weather allows. Nonetheless, if you want a book that gives you much solid information in a tight, focused and well-presented arrangement, Edge’s power photography guide is the NatureScapes eBook for you. Order here directly from NatureScapes’ order page. Nice writeup. If I ever find myself going out there, I will be sure to pick this up. Thanks, Mark. Bret’s eBook guide just seems simpler and easier to carry along to find what interests you. Thank you for reading it, Blakemore.